If I were going to reread books, I'd probably reread Mockingbird and P&P and the like. But I'm not much of a rereader. 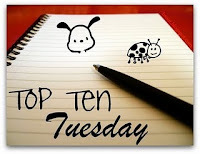 My post is Top Ten Books I Want to Reread. And remember that this is the last week to sign up for my contest to win a $25 Amazon giftcard! I really want to reread The Hobbit before the movies comes out. I hardly remember anything about it other than I loved it. :) And I never finished all the Hitchhiker books, so I need to reread the first three and then finish the series. LOL at number 10! I love Anna Karenina- it's really really great when you're not too scared of it! (Ok, I was a bit scared...) Also, YES to To Kill a Mockingbird, I didn't even include it on my list because I just constantly need to re-read it anyway! Oh no! Is Ulysses that bad? And here I just thought it was the person reading it to me on librivox that was killing all the joy in the room, and my life. Ah well. At least I'll be able to say I survived it. Coming in at over 250,000 words, Ulysses scares me off! Oh! The Hobbit! That need to happen. I haven't read that since I was fifteen. I new when I saw A Tale of Two Cities on the list in my Google Reader that it had to be you two. You're the only big Dickens fans I know of (in the blog world anyway). I still haven't gotten to that one. Loved Great Expectations though. Hitchhiker's Guide is on my list, too. Amazing book. To Kill a Mockingbird and The Hobbit were also both great. 2, 3, 5, 6, & 7 are all books I'd like to re-read too! I'd like to try to read Anna Karenina at least once. Good variety in your list. I need to reread TKAM and I have for years. I have Ulysses on my list seriously since I've made several attempts that I cut short and so technically haven't read it (although I feel like I have).